I have always used iron oxides to color my soaps, but every now and then, the colors separate in my soap. Now, I know it isn't my recipe because I often make a big batch of soap and separate it into two batches to color differently. See the attached pictures. For this batch, I mixed until it was at a light trace then separated the batch into two different 2 lb batches. I scented and colored the yellow batch then scented and colored the orange and pink batch the exact same way. Do you think it was just too far in trace when I added the color? The liquid soap looked very evenly mixed, with no streaks. It only shows up after I take it out of the mold and cut it into bars. 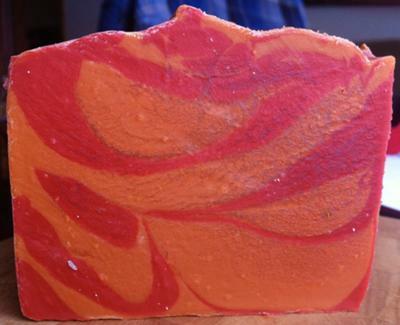 First off...lovely looking soap!! 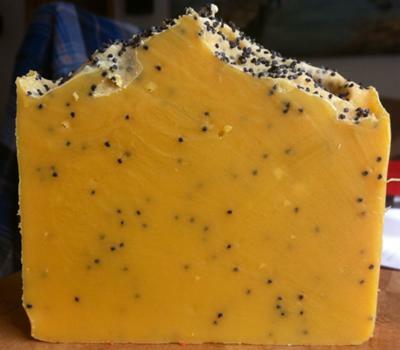 It's such a special treat when someone takes the time to post pictures of their soap. It also makes my job so much easier. It looks to me like the pink/orange soap has overheated a little and this is what has caused the colour to have a seperated look. Next time you make soap be sure to check it during the insulation stage. As soon as the soap has gelled, open it up so it will start to cool down. Sometimes, if left wrapped up, the soap will continue to heat up after it has fully gelled and it can get too hot. This crackle look you have can be one result. Another sign of overheated soap is the famous 'alien brains' look that can decorate the top of the soap log. Other signs include cracks down the top of the soap, heaving mounds on top and craterous holes inside the soap logs. I am trying to see what the problem is here (except for a grainy looking texure). Where is the seperation of colours? Just trying to understand!